1. Cut each potato into 4, place in a large saucepan and cover with cold water. Bring to boil and boil uncovered for 10 minutes or until tender when pierced with a stick. Drain and let it cool completely. In the meantime, heat oil a small frying pan and cook the diced bacon until nice and brown. 2. Combine together the mayonnaise, sour cream, garlic into a mixing bowl. Top with the dill, gherkin, carpers, shallots and mix well. Taste and season with salt & pepper. 3. Gently toss in the potatoes and bacon bits and refrigerate for 30 minutes or more. 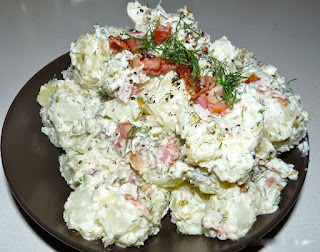 You can store the potato salad in the fridge for a few days. You can also top it with pieces of hard boiled eggs if you’re serving it as a main!